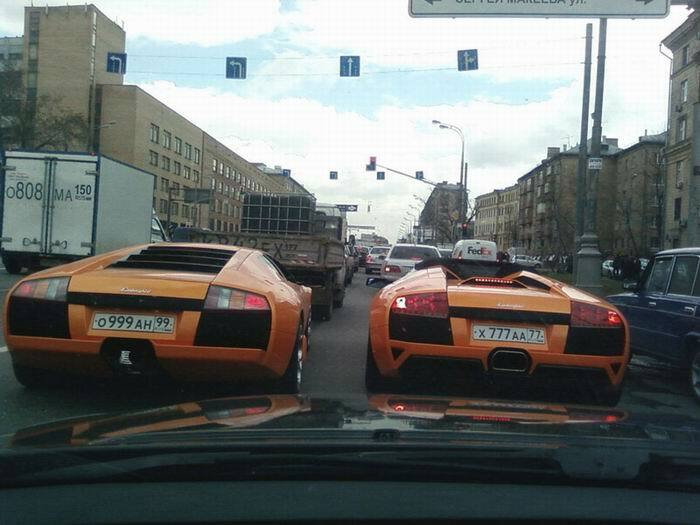 You can often meet at Moscow streets a few expensive cars at once. Like those two $300K Lamborghinis. Hi! Just wonder why your images does not show up in my RSS- reader anymore, I am using Google Reader. Would be nice if you fixed this issue, thanks for the great site! He wants you to see the ugly ads. Those Lambos gotta cost more than $300K each, right? Nop, the one on the right is the new LP640 which costs “only” 380 000 U.S. dollars. Can you still buy sirens for non-governmental vehicles as you could in the 90’s???? What? how’s that related to my question? if you refer to the special decoration for goverment cars which mobsters and businessmen buy from croocked officials so yes, as far as i know they still do it. Sorry, that was supposed to be question addressed to Paul-86. About two weeks ago, I was driving from Dallas to Fort Worth and saw a Lamborghini and a Ferrari just sitting abandoned right next to each other on the highway. My guess is that they were racing at extremely excessive speeds and the police pulled them over and dragged them off to jail. It was a funny sight. Looks weird to see such expensive cars caught in the traffic jam! In traffic jams all drivers are equal (except Bruce Almighty on his Saleen S7)! 77, 99 and 177 are Moscow city. 97 is Moscow region. Ive lived in moscow,and cuz city is so big they have 77 50 and 99 numbers for this state. You are not right. They use 77,99 and 177 codes for Moscow, because there are too much cars in Moscow. And the 177 series will come to the end soon, so there would be some other code also (probably 199?). Ilya Kovalchuk races Alex Ovechkin during rush hour! Where are you, my Prince on white Lamborghini? You have me, a fat jew with Lada – be happy with that!!! It’s funny to contrast and see a Lada to the right, and Soviet-era(?) truck after the left car. Capitalism has well and truely hit Russia in the last couple of years. I’ve seen one of this cars in moskow and tried to keep pace with. But even in traffic jam it fast enough! You see the same thing every day in Miami. Octanovi ix oboix, vozmi dokymenti, cproci otkyda dengi ctashili – ee mojno cpokoino cajat v tyrmy crazy! Vot vashi ee businessmeni xrenovi! Ractashili ctrany vklychaia c glavnim vorom Pytinim! Vcex v odny oxapky ee k ctenke! Ne odin business v rocii legalnii a kotorie legalnie vce ravno dengi pizdiat! vot vam ee Lamborghini dlia miclei! These guys are filthy RICH! I mean come on, 2 orange Lamborghini Mucielagos(the one on the left is a LP640 and the other one is the Spyder, which means they’re not the same)! Notice their tag plates too – they both are made of same numbers, which is considered extra cool in the world of Russia’s super-rich and it may cost up to $50K in bribes to Moscow MVA to get such an exclusive tag. The one on the right is probably more expensive because the letters on it spell out a meaningful exclamation. I really feel sorry for this breed. They are so deeply victimized, they did not even realize that feeling okay to “show the money”.